To some people, a job is something that pays the bills. However, to Blake and Jolie Cooper the job is more; it’s their life. Blake and sister Jolie are the fourth generation of Coopers to own and operate Cooper Music, one of America’s largest and most respected piano retailers. It’s only logical that music would be more than a job for this generation. Blake, who was a bass player and singer in numerous rock bands in his youth, began working at age ten when the family store was in New Kensington, Pennsylvania. At that time Cooper Music sold virtually everything music related. Blake, who became company president in 1991, recalled “We did it all then. Whatever ever was hot we sold; guitars, organs, bongo drums, it was all there. We offered everything musical.” Blake recalls sitting in the boiler room of the Cooper building cleaning horns upon their return from rent while Jolie designed and painted store interiors after school. Not exactly glamorous work, they admit, but it showed them how to care for customers… and how owners must be ready to perform any job. That goes with the territory. 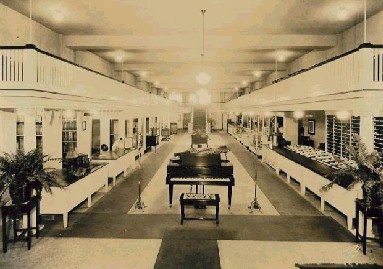 In 1906 Jonathan Cooper founded the business, known as Cooper Brothers Inc. A former coalmine carpenter, he utilized his woodworking skills to craft and sell pump organs. Then, year-by-year, new products (including pianos) and services (such as restoring them) were added. The growth of Cooper Music always had been evolutionary; creating a solid foundation that carried the company through good times and bad. Economic changes in the industrial north coupled with great business opportunities in the south brought the company to Atlanta. Even today that ability to change with the times has served Cooper Music well. For instance, Blake Cooper attributes his company’s current success to a decision in the early 1990s to pull back from mall stores of the 1970s and ’80s, and place renewed emphasis on pianos, organs, as well as teaching programs such as Music and Wellness. Blake Cooper, seeing how the business had changed, knew that a shift in product strategy was needed if Cooper Music was to grow. That’s when he consolidated the company’s operations, folding the mall stores into one 10,000 square-foot superstore with three showrooms, a rental department and concert hall. There are numerous studios for group and private music lessons. Soon to come were branch Music and Wellness teaching studios. Today consumers can browse through a huge inventory of new, used, and restored pianos, as well as digital pianos and church organs. With about 30 brands on hand, Cooper Music is the exclusive dealer for displaying the largest selection of pianos and organs in the Southeast. A shining star of Cooper Music’s game plan is the Cooper Music Rental Program, which Cooper expanded shortly after taking the company helm. This program allows people to rent any piano they like and try it out at home, for a monthly fee as low as $25. Another exciting addition to the Cooper program is Cooper’s Lowrey Organ Center, group lessons for seniors who enjoy music. Attracting hundreds of seniors each week, the adult music and wellness keyboard classes grow in popularity. In addition to an enjoyable… and life-enhancing hobby, participants can make new friends with galas that include pot luck dinners and a musical programs. “Music is therapeutic for all kinds of physical and mental ailments,” says Cooper “It makes life worth living for many people, including myself.” That’s part of the reason why Cooper shares this healing gift by donating pianos and organs to area churches and retirement homes. Third generation, David Cooper and his wife, Jean, still keep a hand in the business as consultants. Blake’s sister, Jolie, is the CFO. Moreover, company president Blake makes himself available to talk to his customers whenever they have a problem or question. The Coopers may not know everyone in the city by name-as they did in western Pennsylvania, but they still believe in treating customers like old friends… like part of the family.